North Korea will “reconsider” a planned summit with U.S. President Donald Trump if Washington forces the country to unilaterally abandon its nuclear weapons, the DPRK’s first Vice-Minister of Foreign Affairs Kim Kye Gwan said on Wednesday. In a Korean-language report carried by the Korean Central News Agency (KCNA), Kim said the Trump administration had issued “ludicrous statements which are extremely provoking” ahead of the DPRK-U.S. summit – scheduled to be held on June 12 in Singapore. The vice foreign minister denounced several senior officials at the White House and the U.S. State Department, including National Security Adviser John Bolton, for raising, among other things, the potential for a “Libyan model” for denuclearization. “If the Trump administration comes forward to the DPRK-U.S. summit with sincerity for the improvement of the DPRK-U.S. relations, it will receive the deserved response,” Kim said in the written statement. The DPRK vice foreign minister said the comments showed the U.S.’s “impure intention” to push the DPRK into a Libya or Iraq-style situation instead of resolving the issue through dialogue. The statement particularly singles out John Bolton. “We’ve explicitly clarified who Bolton is, and we don’t hide the repulsion toward him now,” it reads. “I can’t hold my violent anger over the U.S. behavior, and I doubt if the U.S. sincerely hopes for the improvement of the DPRK-U.S. relations through wholesome dialogue and negotiation,” he said. Kim said it was “stupid” to compare the DPRK – a nuclear weapons state – to Libya, which was at the early stages of developing nuclear weapons. In his statement, the DPRK diplomat also reiterated Pyongyang’s stance that Washington had downplayed the North’s “generosity and bold measures” in pursuing dialogue, instead citing it as the result of a maximum pressure campaign. “We’ve expressed the intention of the denuclearization on the Korean peninsula, we’ve clarified several times that the prerequisite is to terminate the U.S. hostile policy against the DPRK and nuclear blackmail,” he said. Kim also, notably, dismissed claims economic incentives could be given in return for North Korean denuclearization. The comments are likely a response to Secretary of State Mike Pompeo’s comments earlier in the week that “private sector Americans coming in” could be allowed to go to the North to improve its energy, infrastructure, and agriculture sectors in the event of a nuclear deal. 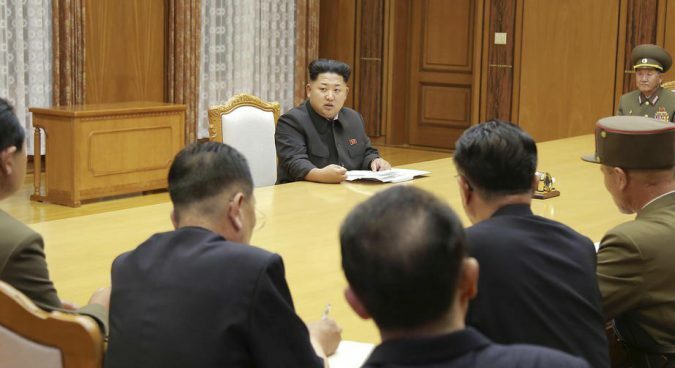 In a marked shift from the diplomatic niceties of the past few weeks, Wednesday also saw the North cancel a planned high-level inter-Korean meeting, citing the ongoing joint ROK-U.S. Max Thunder military exercise. An accompanying statement also warned that the North might withdraw from the upcoming summit. “The U.S. will have to think twice about the fate of the DPRK-U.S. summit now on high agenda before a provocative military racket against the DPRK in league with the south Korean authorities,” it said. Subscribe to read the remaining 631 words of this article.